Brillat-Savarin is also credited with being one of the first low-carb dieters, so one assumes he would be honored to have a protein-rich, creamy French cheese named in his honor. Brillat-Savarin the cheese is a pasteurized cows-milk triple-creme brie-style specimen produced in Normandy. 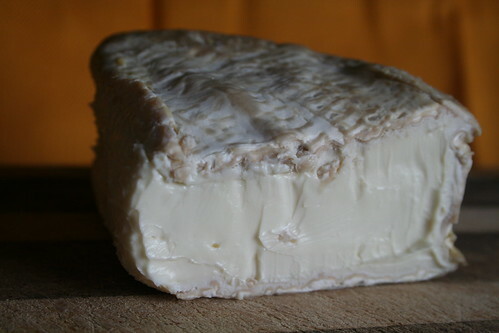 It is decadent indeed, delightfully creamy, with a bloomy natural rind. It is a touch more sour than your typical brie, with that subtle tang you’d find in the white parts of a bleu cheese. Best eaten with a spoon, or slathered over a nice fruit-studded bread. It is an ideal partner for a nice glass of French champagne*, if you’re so inclined. *Speaking of celebrations, we’ve noted elsewhere but neglected to mention here the official cease-fire in the Roquefort wars. Americans can continue to enjoy Roquefort, Iberico ham and Pellegrino for the foreseeable future. Vive le Roquefort! 2 – In second place, the laudatory “Ode to Roquefort” by DanG. We also have to extend an honorable mention to ohcassis for the bold, anti-Roquefort entry in our contest. We believe everyone is entitled to their own opinions on cheeses, after all. Be sure to read all the entries, if you haven’t yet. Ode to Roquefort: Cheesy Poetry Contest! Alright, cheese aficianados. You’ve signed the petition, you’ve stocked up on Roquefort while you can, what’s left but to enjoy it in every conceivable way until it’s yanked from our shores on March 23? Why not profess your love for the stinky French blue to the world, and submit your best sonnet, rhyme or haiku for the Cheese & Champagne “Ode to Roquefort” Valentine’s Poetry Contest! Share your best cheesy lines in the comments below, before midnight Sunday, February 15. We’ll select our favorite on Monday … and ship the lucky Poet Roquefort a first edition C&C “Free Roquefort!” t-shirt! Give us your cheesiest lines, rhymed or otherwise! As our fellow cheese lovers have likely heard by now, one of the parting acts of the Bush Administration was to announce the tripling of tariffs on France’s Roquefort cheese. France’s iconic cheese had been the subject of a 100% tariff since 1999, in retaliation for Europe’s rejection of hormone-treated US beef. As the EU has refused to back down on their stance, the US decided to shuffle the products subjected to tariffs to be more persuasive. While a slew of European products were added to the list, Roquefort alone was singled out for a 300% rate. 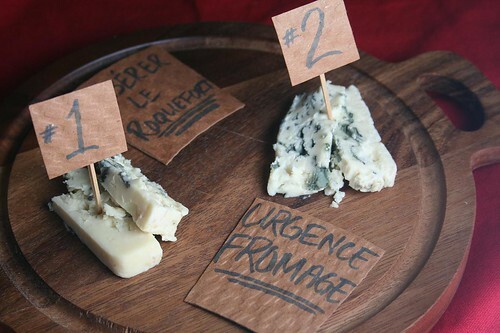 As Roquefort already goes for as much as $30/lb., the increase effectively shuts it out of the US market. The tariffs go into effect March 23, so we wanted to review this luxury treat before it is banished from our cheese counters. 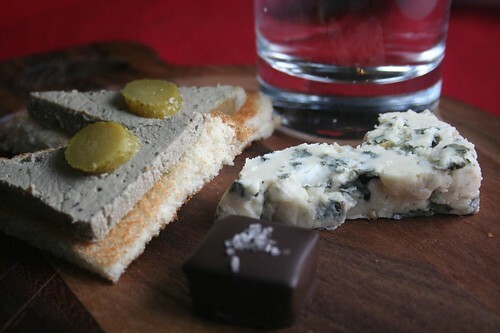 And if your significant other appreciates fine blues, consider giving the gift of Roquefort this Valentine’s Day. Roquefort (#2 in above photo) is a distinctive blue cheese made from raw sheep’s milk in its small namesake village in the south of France. 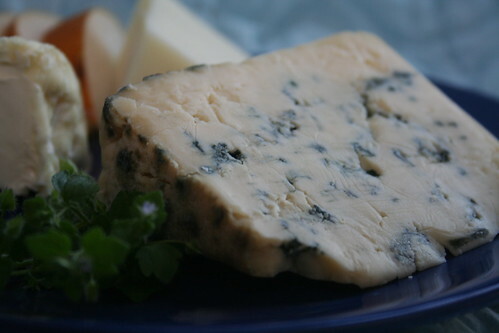 It is creamy, rich and fabulously pungent from the thick blue veins. It is ideal drizzled with honey and enjoyed with port after dinner, or melts smoothly over a juicy (hormone-free) filet mignon. In an attempt to identify a possible domestic replacement, my sister-in-law and I conducted a blind taste test of Roquefort and Old Chatham Sheepherding’s Ewes Blue (#1 above), one of the few American sheep’s milk blues I could find locally. (There’s also Ba Ba Blue from Wisconsin’s Carr Valley.) While the Ewes Blue was enjoyable, we both correctly identified the French cheese by its distinctive creamy texture and more complex flavor. P.S. Sign the petition to ban hormone-ridden meat, not cheese!